Each week thousands of people fly an airplane without ever leaving the ground. 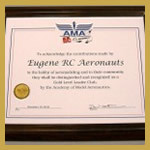 The Eugene RC Aeronauts welcome you to the incredible sport of remote control aviation. Building and flying your own radio control (or RC) plane is a most rewarding and exciting experience, people of all ages have learned to fly RC planes, and you can too! Our flying site is located near Alvadore which is approximately 10 miles north of Eugene. When you visit our airfield you will see and hear model airplanes of all shapes and sizes. Be aware that RC airplanes are not toys, they are miniature aircraft. Some planes are capable of flying at speeds over 100 miles per hour. To fly at our airfield you must be a member of the American Modeling Association. You can pick up an application to the AMA at most local hobby stores or you can contact us and we will send one to you. We suggest you send in your application early as it takes one to three weeks for the AMA to send you your membership card. The Aeronauts have instructors in the club to help you get started and teach you how to fly. There are accomplished pilots who have accumulated hundreds if not thousands of hours of flight time and they are really nice people. Until you solo, you should always fly with an instructor. This is the best way to learn how to fly RC. If you insist on flying by yourself, especially in the early stages, your aircraft is doomed. Before you invest three to five hundred dollars in RC equipment we invite you to fly our “Intro” plane. This is a plane that a club member has maintained for the general public to fly. You do not need to be a member of the AMA to fly our intro plane. You will need to contact an instructor to schedule a flight or two. Our meetings are held each month at Abby’s Pizza on River Road at 7:00 p.m. or at the field in the summer. We welcome you to our club, have fun and fly safe. AMA Newcomers Guide AMA’s “Newcomer Guide” explains how to best enter the fascinating world of model aviation.